Since 2003, StoryCorps has recorded the voices of ordinary people with something interesting to say. Among them are veterans, people with Alzheimer’s, African-American storytellers, Latinos, and September 11th rescue workers and survivors. Nearly 100,000 people in 1,800 cities across the U.S. have told their stories, which have been recorded for posterity. 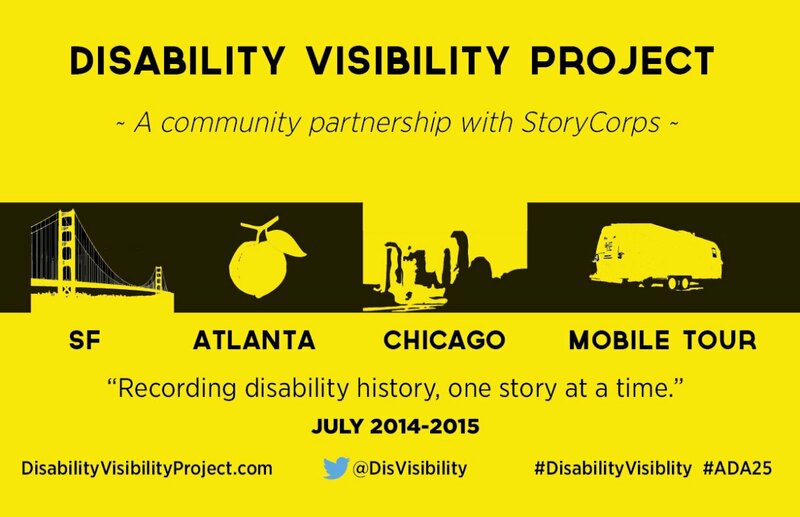 Now, with the 25th anniversary of the Americans with Disabilities Act, a new organization has partnered with StoryCorps: The Disability Visibility Project. The goal of this initiative, in the words of its founder, Alice Wong, is “to collect the diverse voices of people in the disability community and preserve their history for all, especially underrepresented groups such as people of color and LGBTQUIA people.” Started on July 25, 2014, the year-long grassroots project will run through July 2015. As with StoryCorps, “interviews are conducted between two people who know and care about each other.” However, although the two organizations have formed a partnership, the Disability Visibility Project does not represent StoryCorps. It is worth noting, though, that the Disability Visibility Project is already affiliated with 83 media partners (as of this writing). The Americans with Disabilities Act is a landmark piece of legislation whose legacy extends to the United Nations Convention of Persons with Disabilities. The Disability Visibility Project gives it a human face―or, rather, many human faces. This entry was posted in Disability Awareness and Appreciation, Voices of People with Disabilities and tagged #abilities, #advocacy, #oralhistory, ADA25, AliceWong, Americans with Disabilities Act, disabilities, DisabilityVisibility, StoryCorps, storytelling, voice. Bookmark the permalink.